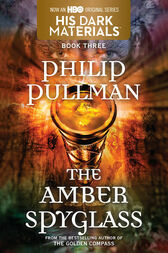 The unforgettable His Dark Materials trilogy that began with The Golden Compass—the modern fantasy classic that Entertainment Weekly named an "All-Time Greatest Novel" and Newsweek hailed as a "Top 100 Book of All Time"—and continued with The Subtle Knife, reaches its astonishing conclusion in The Amber Spyglass. Throughout the worlds, the forces of both heaven and hell are mustering to take part in Lord Asriel's audacious rebellion. Each player in this epic drama has a role to play—and a sacrifice to make. Witches, angels, spies, assassins, tempters, and pretenders, no one will remain unscathed. As war rages and Dust drains from the sky, the fate of the living—and the dead—comes to depend on Lyra and Will. On the choices they make in love, and for love, forevermore.